Guilherme Rosales is a Graduate Student at UBC, doing his master of Public Policy and Global Affairs. He previously studied philosophy and Political Science, and has been doing seasonal work as a fire fighter for many years. Guilherme has seen first hand the unprecedented environmental changes from climate in the form of a growing number of wildfires in the region. In light of the wildfire season here in Scandinavia, we encourage the reader to absorb the flames in this poetic photoseries and to fully embrace the impotency of human power over our elements. Tekst: Guilherme Rosales, Graduate Student at UBC, doing his master of Public Policy and Global Affairs. 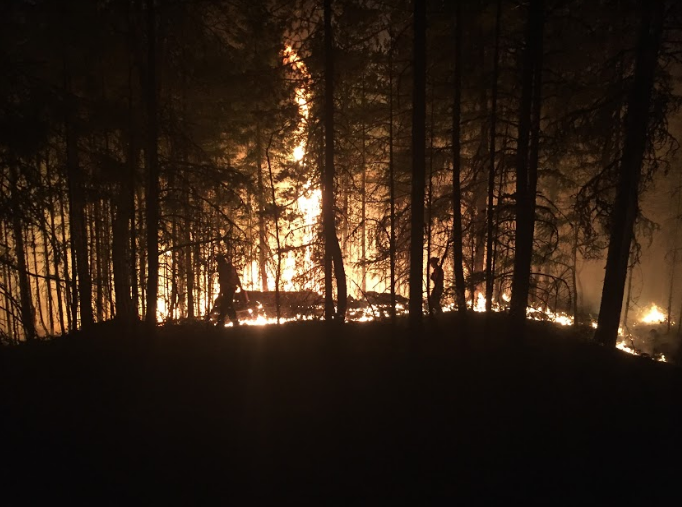 Burn off operations on a grove of coniferous trees. gathering, and storing for its’ winter hatch. Fighting fire in the evening and thickening smoke. It’s a curious and amazing thing to be whisked away by a helicopter and flown above mountains to your destination where a wildfire incident has started. It is surreal. When you land, you might just forget who you are and where you are, especially when your in the middle of nowhere. A place other humans probably have never been, or if they have, not for a very, very long time. The seeming futility of human efforts against wildfires. They both become ethereal. Looking back on all the wildfire seasons I have done, it all seems to blend; or instead fall like rain all around me. Every moment crystallized in a falling rain drop. The story you tell yourself of what happened cannot but help take on a mythical form. It seems so wild, untamed and crazy. It felt like I was a pioneer at times, standing on the top of a mountain trying to figure out where to go next to catch and stop the fire, or sometimes to find the fire. I was searching for fire in the wildlands of B.C. ; places people never go to anymore; places untouched by human influence or effect. How is it not, at least, a little bit mythical sounding. An Aerial view of the burn pattern of wildfire near Tumbler Ridge,BC. The smoke towers in the distance, forming a column against the sky. Then it turns into a cloud. Finally it blots out the sun for a moment before turning it blood red. The flames are alive. They dance with the wind hungrily feeding on the ground before consuming the trees. What they leave behind are smouldering white ash-pits with glowing embers underneath that sometimes look like flowing lava. It spreads faster than anticipated and moves in ways that are unpredictable. Just when you think you know wildfire it does something you have never seen before. Wildfire never ceases to amaze or inspire awe. Just watch closely. Wildfire is alive. Burn off operation in Vancouver Island. A Fire Devil kicked up and spun around for a half hour. When we reflect upon the past we give up momentarily our capacity to think about our future. Or rather we disrupt our inherent inclination to think forward, to think past. Yet when brought back to the present moment, we tend to think ahead. Our worries and logical fears give us glimmers of our future. Outcomes of things based in facts. Outcomes of loss for all of us. Perhaps this might be why we enjoy being in nature; because it draws us back to the present with tendrils to the future, but not detracting from the gravity of what drives us to stay engaged with nature. Sometimes you need to stop and appreciate your mystic surrounds. Through all of my adventures I have appreciated every single moment of them, especially the hard ones. Each single one is a reminder of the beauty and amazing splendour of our wild-lands and raw nature on our Earth. Because of this beauty and its’ diminishment by human activity, it becomes pivotal to always attempt to steward and preserve it for future generations. Its’ value cannot be appropriately calculated by any economist, or anyone else. It is a priceless good and all humans enjoy it and need it. Life blooming again from the ashes of wildfire.